In many parts of the world, there are no slaughtering facilities with the proper equipment to kill and process geese. Where such facilities are available, they are the method of choice for killing and processing, particularly if the number of geese to be killed and processed is fairly large. If such facilities are not available, geese can easily be killed and processed by hand. Geese which are to be killed should have their feed removed at least eight hours beforehand to reduce the likelihood of contamination from either faecal matter or material from the digestive tract should it be ruptured during processing. The geese should continue to get water during this eight hour period. For killing and processing a modest number of geese, the method of choice is to use a killing funnel (average length 35-40 cm, entry diameter 25-30 cm, exit diameter 10-12 cm). The procedure is to suspend the goose head down in the funnel (Figure 44). This holds the body and allows the neck and head to protrude. 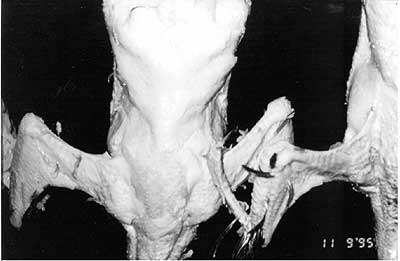 The underside of the neck is turned towards the operator who, holding the back of the goose's head in one hand, severs the jugular vein by cutting on the left side of the neck. The head is not cut off. The funnel prevents the wings from flapping and the goose bleeds freely. Before the bleeding, it is necessary to anaesthetise the bird. Electrical stunning is the best method. Two types of stunning apparatus are available. One is manual and has a grip with electrodes at the end which are set on the eyes of the bird. The second is used in industrial processing plants. Here the geese move on a slaughter line and receive an electric shock when their heads go into a bath filled with an electrolyte. There are two electrodes: one in the solution, and the second in contact with the legs of the geese. However, if an electrical stunning apparatus is not available, a sharp knife (with a blade no more than 1 cm wide and sharpened on both sides) can be used to penetrate the brain through the end of the beak groove in the back of the mouth before cutting the jugular. The blood may be caught in a blood cup. Blood cups are normally made of metal and are approximately 10 cm in diameter and 20 cm deep with a hook to attach it to the beak and a weight in the bottom to hold the head steady during the bleeding process. After the bleeding is complete, geese can be manually dry plucked which gives both a good quality carcass and good quality feathers although it is generally considered to be too labour intensive. The alternative is to scald the carcass by immersing it in water at 60-68°C for 1-3 minutes to loosen the feathers. The precise time and temperature depend upon the feather condition of the birds and may vary considerably between groups of geese. It is necessary to scald the birds only enough to ensure easy plucking. Agitating the carcass in the scalding water and adding a little detergent helps wet the feathers thoroughly. After scalding, the birds are ready for plucking. Normally the large wing and tail feathers are removed by hand and the rest are either plucked by hand or by machine. Either way it is not easy to remove all of the down and pin feathers. To do this a wax dip is used. To make a wax bath, solid poultry wax is melted at a temperature of 65-70°C. The plucked goose carcass is then dipped into the wax and agitated slightly for 1-2 minutes. 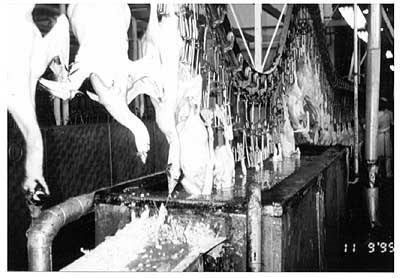 The goose carcass is then removed from the hot wax and dipped into cold water to harden the wax. The carcass is put back in the hot wax to add a second layer of wax and then into the cold water again. The wax is stripped off the carcass either by hand or with a dewaxing machine and takes with it the remaining down and pin feathers. Note that the used wax can be melted, cleaned and re-used. After the removal of any feathers that may have been missed through either the plucking or wax dipping process, the carcasses are ready for eviscerating. The dressing percentage for geese is approximately 70 percent with giblets and 63 percent without. After evisceration, the carcass is ready for immediate consumption or storage, which may mean further processing. If the carcass is to be stored, it must first be cooled. There are some differences in the slaughtering of force-fed geese for their fatty livers. Given the high value of the fatty liver, which represents the main commercial part of the goose in this case, it is necessary to take extra care during plucking. Small feathers and down on the abdominal section of the bird are not taken off with a classical rubber finger plucking machine as it can damage the liver. 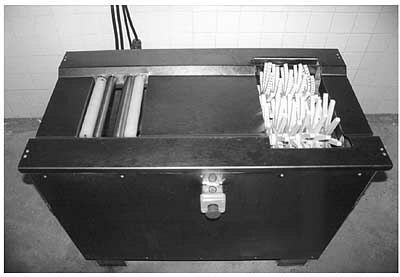 A special piece of equipment, with two plastic rollers turning in opposite directions giving a softer action, has been developed (Figure 49). The feathers are pinched between the rollers and removed without any damage to the liver. If this kind of equipment is not available, manual plucking of this area is recommended. After the force-fed geese are plucked, there are two schools of thought as to the next step. The classical one is to cool the whole bird and eviscerate it after at least 12 hours of cooling. The second approach is to extract the fatty liver immediately after slaughtering, and to cool it as fast as possible. The latter process provides a product of better quality as it reduces fat loss during cooking. Where freezing facilities are available, the long term storage of frozen goose carcasses is both easy and convenient. The carcasses should be packed in plastic bags, with as much air removed as possible, preferably by vacuum pump. The bags should be made to adhere as tightly as possible to the surface of the carcass to avoid freezer burn. This is accomplished by submerging the bag into hot (80-90°C) water after sealing, which causes it to contract tightly around the carcass in it. To keep the carcasses for up to 12 months, a temperature of -30°C is required. If the carcasses are to be kept for only six months, a temperature of -18°C is adequate. Curing and smoking of goose carcass parts is also effective in preserving carcasses for limited periods of time. The normal process is to first cure the goose carcass in a brine solution and then to smoke it. A curing solution of 14 percent salt (NaCl plus Nitrite) is suitable. Sugar and various spices may be added for flavour and in accordance with tradition. The goose carcasses should remain in the solution for 48 hours at a temperature between 2-5°C. After removal, the carcasses can be rinsed in water for one hour and then smoked. If no further cooking is required after smoking, then a smokehouse temperature of 85-90°C is required and the internal temperature of the carcasses should reach 63-65°C. Otherwise, a smokehouse temperature of 40-50°C is adequate. The smoking time required will depend on the density of the smoke and can vary from 3-5 hours. Preserving meat from forced-fed geese by first cooking the meat and then preserving it in jars or cans is popular, not only as a method of preserving goose meat but also because of the variety of products it can yield. The first step in preserving goose meat in this way is to cut the carcass into parts. This means removing the breast meat and cutting off the legs, thighs and wings. These parts are then cooked and put into jars or cans for heat preservation (one hour at 100°C is suitable for meat which has been previously cooked). Adding liquid goose fat to each container before heat preservation and sealing, not only adds flavour but helps to preserve colour and provides a protective layer of fat on top of the meat. 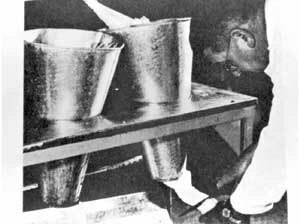 To obtain clean liquid goose fat, the fat removed from the carcasses should be heated to 100°C to remove the water and then poured through a sieve to remove the non-fat particles. Goose meat can also be stored by first removing it from the carcass and then using it alone or in combination with other meats and spices to make a variety of sausage and other meat products that can be preserved by heating, smoking or drying. In Eastern Turkey, where the external winter temperature is generally below freezing, the storage of goose meat is achieved through a combination of salting, dehydration and natural refrigeration. After killing in late November, the goose carcasses are salted and then packed tightly in a box for one week. They are then hung in the air to dry. After drying, the carcasses are stored under natural temperature conditions until eaten. Table 10 shows the weight and size of a number of carcass components of geese slaughtered at 11-17 weeks of age.